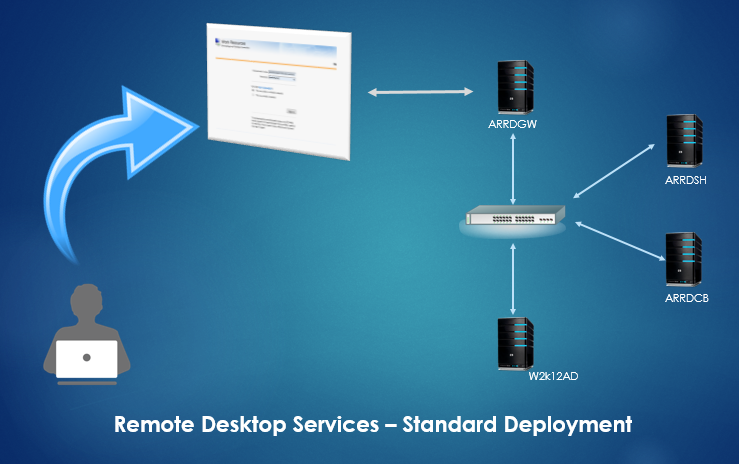 Remote Desktop Services formerly known as Terminal Services (prior to windows server 2008 R2) allows you to access session based desktops, virtual machine based desktops and remote applications in a remote server. 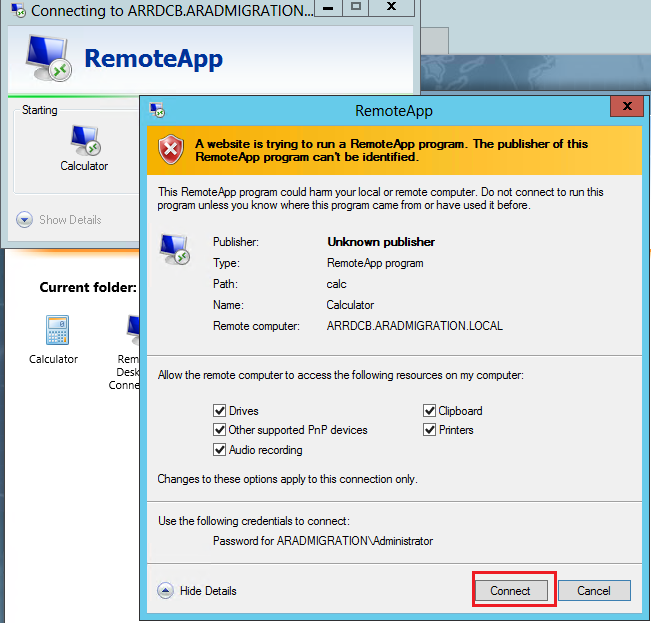 Here we are going to talk about the Remote Application Publishing on a remote server and access from a client computer. 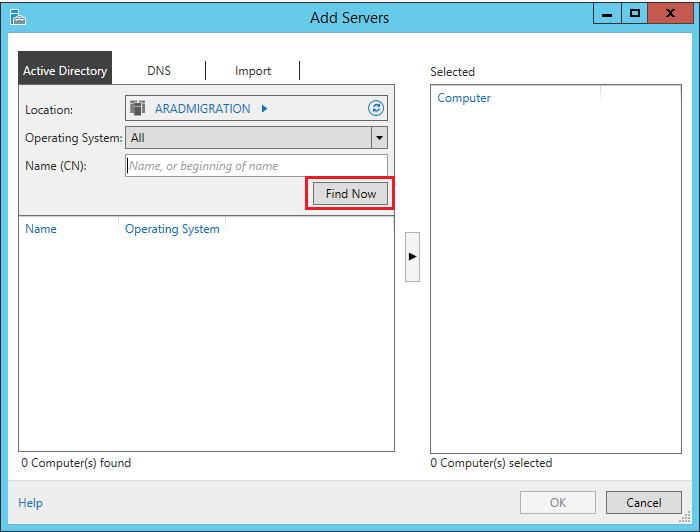 There are two main deployment methods and I already demonstrate “Quick Start” Deployment method which we can publish applications using a single server. 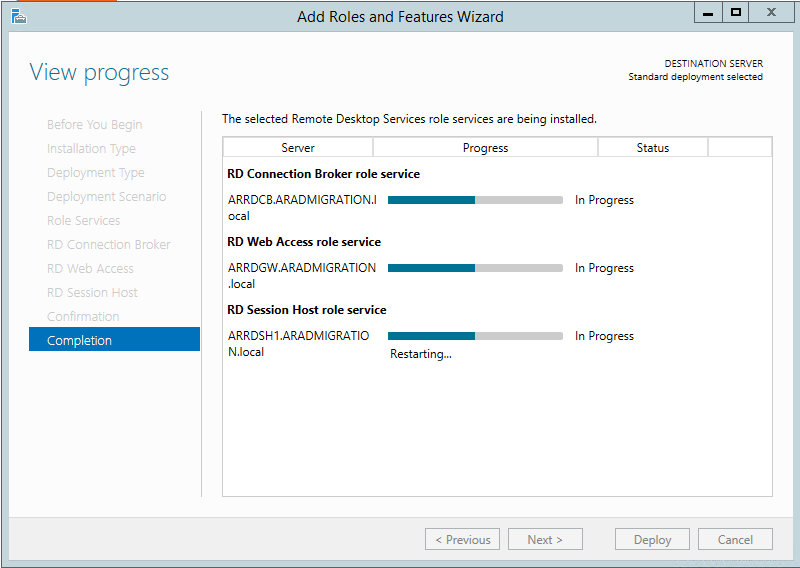 I already setup three new servers for “Remote Desktop Connection Broker (ARRDCB)”, “Remote Desktop Session Host (ARRDSH)” and “Remote Desktop Web Access (ARRDGW)” services to start the deployment. 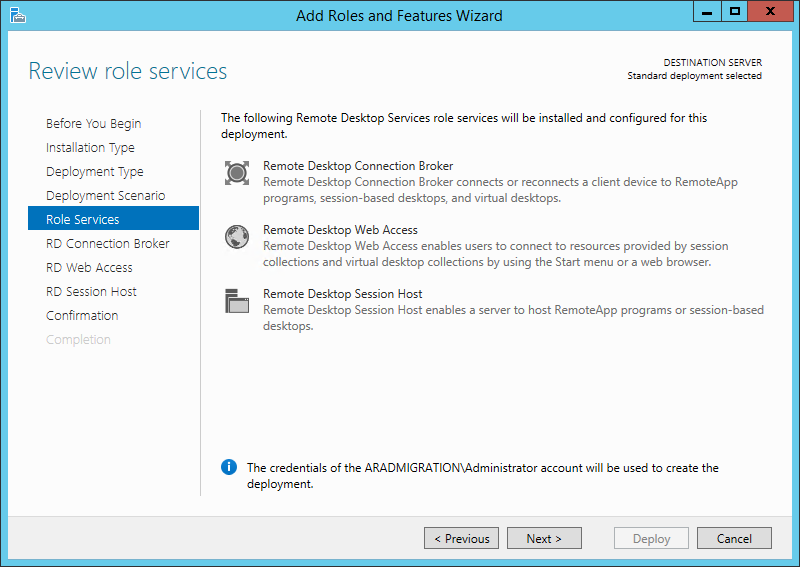 I already discussed in detail about these services and if you haven’t read my “Quick Start” Deployment guide…. don’t worry, I’m going to discuss there services again. RDCB helps to connect and reconnect the user sessions to the RDS. 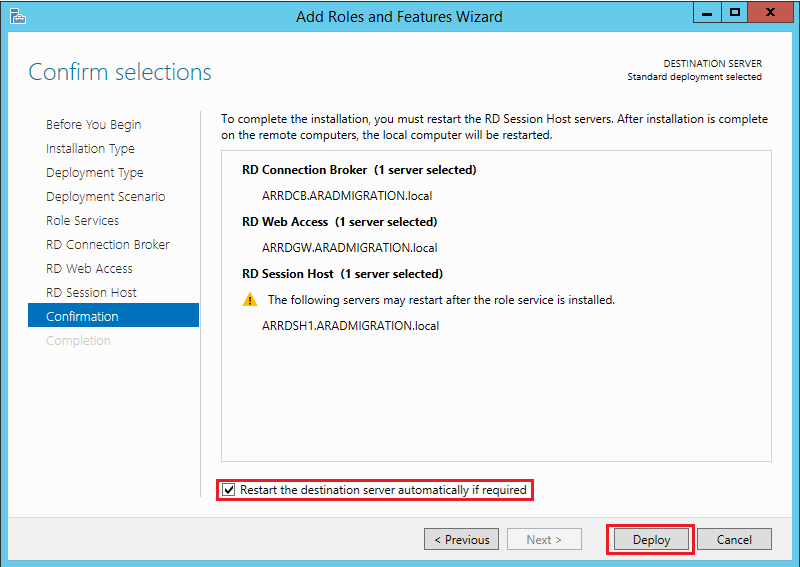 If user disconnect the session while he was accessing the RDS or Remote Application, this RDCB helps to reconnect to the same session. 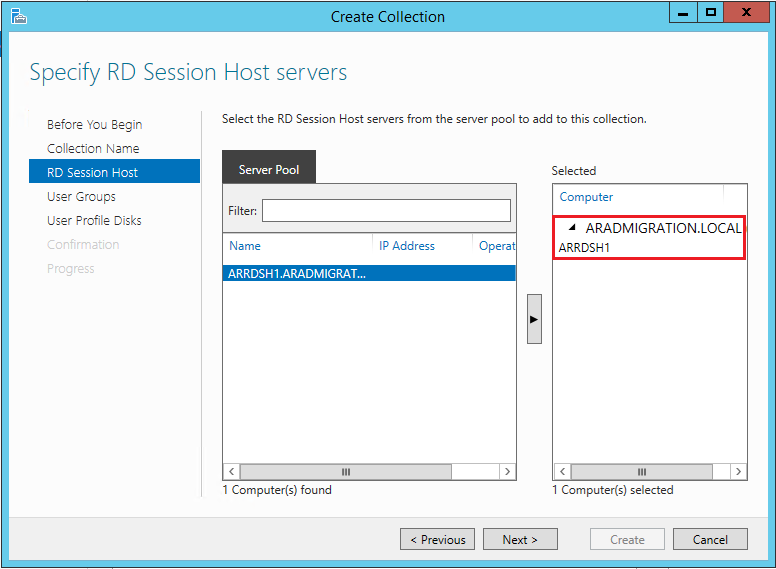 RDCB keeps the track of the user sessions in a Load Balanced RDS server farm. 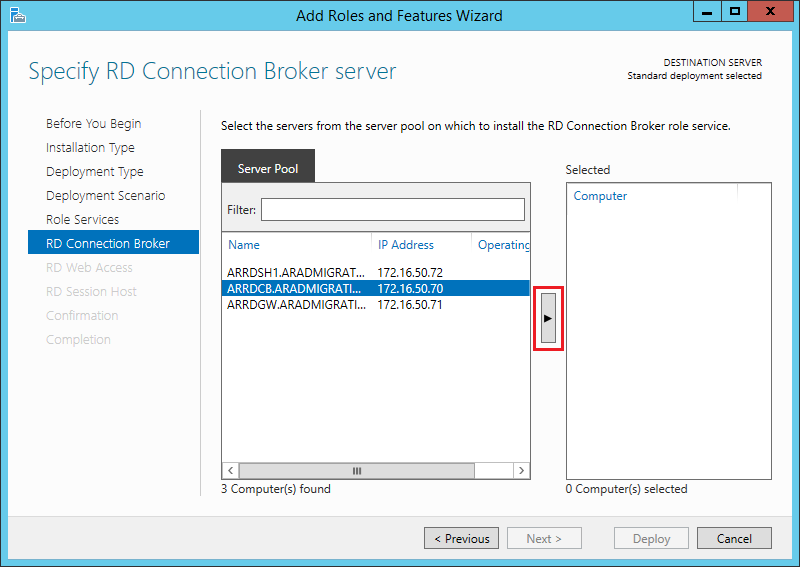 RDCB keeps details such as RD Session Host details of the users sessions , state of the session, user name associate with the session, session ID. 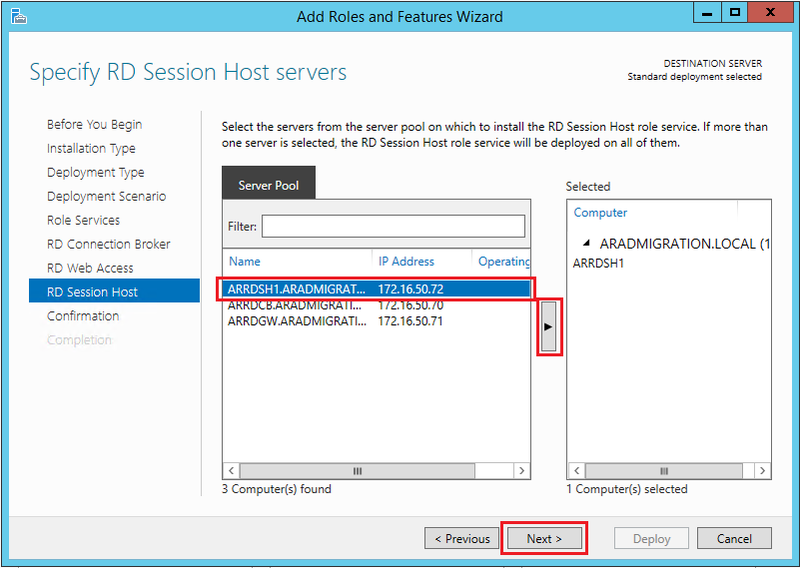 If there is a new request RDCB checks the previous session states and connect to the same session if it disconnect from the RDSH. 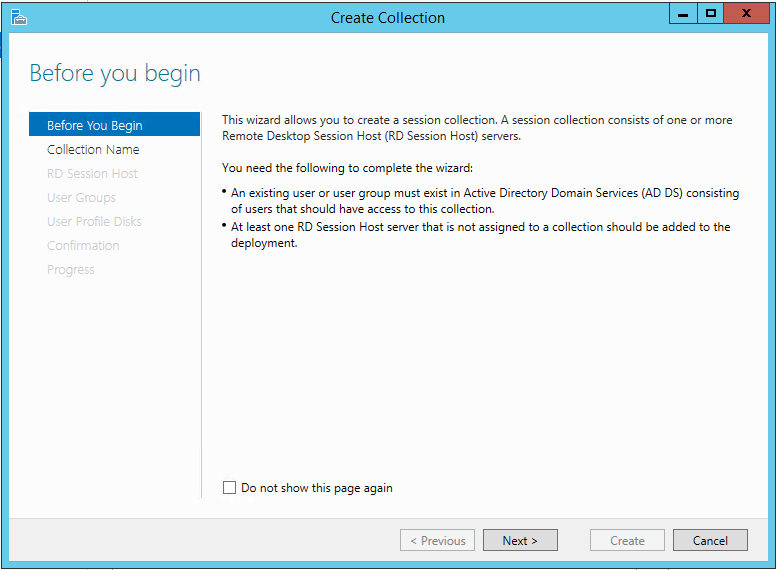 If there is no any previous sessions available it connects as a new session to an available RD Session Host. 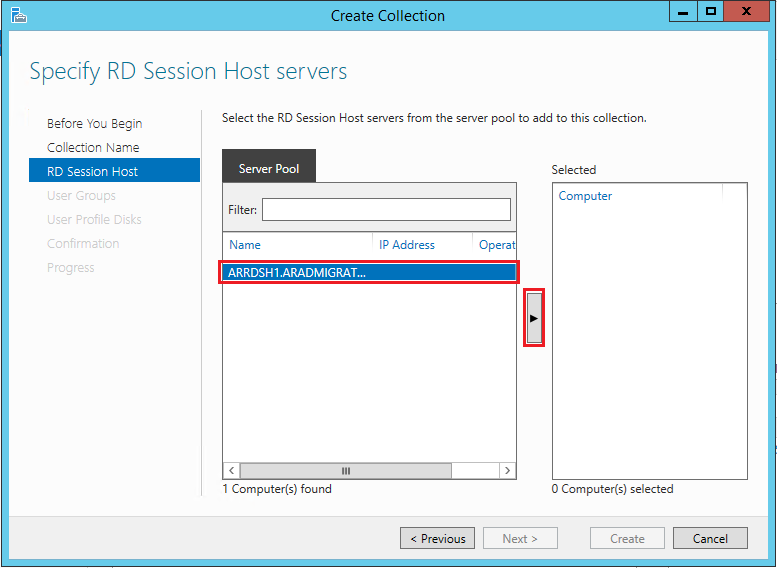 RDSH is the server which host all the windows based applications to run during the users sessions. 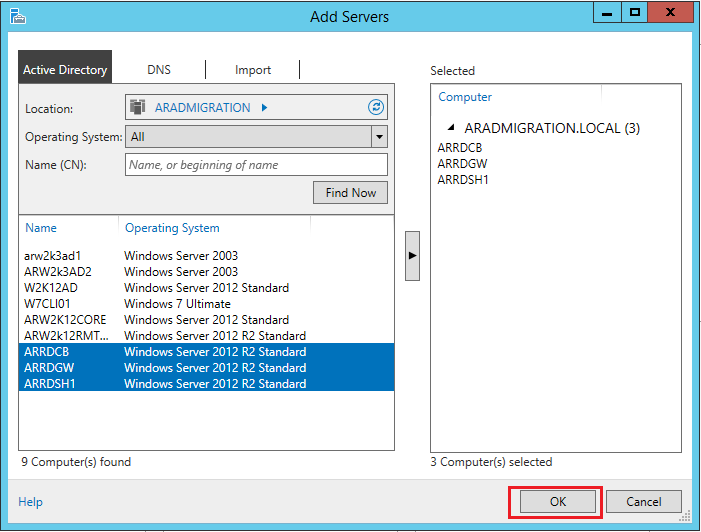 There can be multiple RDSHs in the server farm and it can be load balanced. 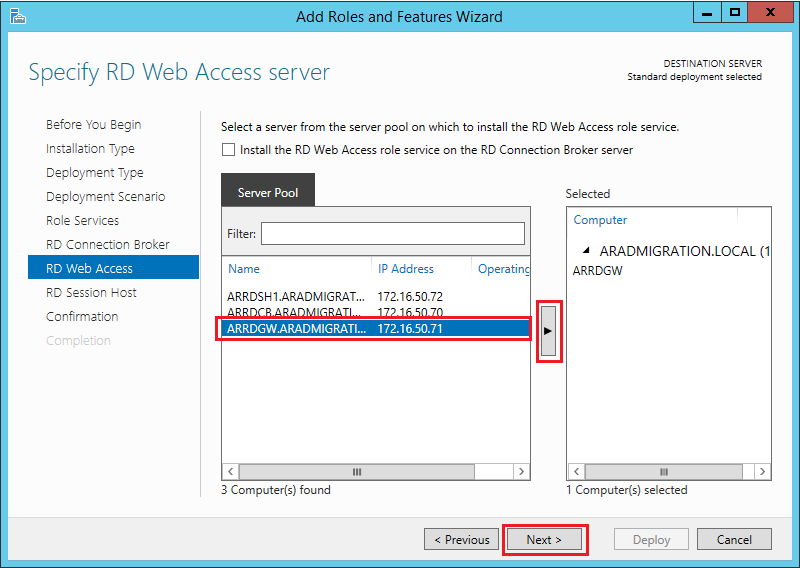 RDWA is the web console or the web based user interface which enables to users to access the remote resources or the hosted applications. 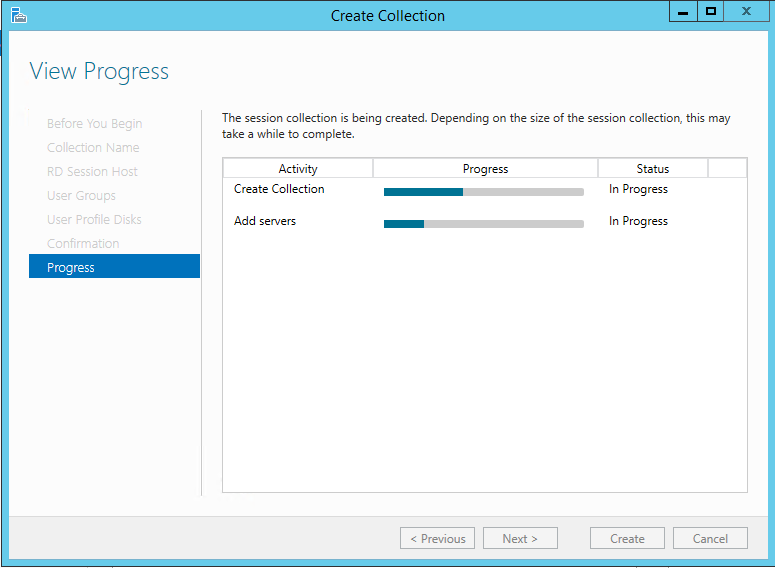 These resources can be published using session collections or virtual desktop collections. 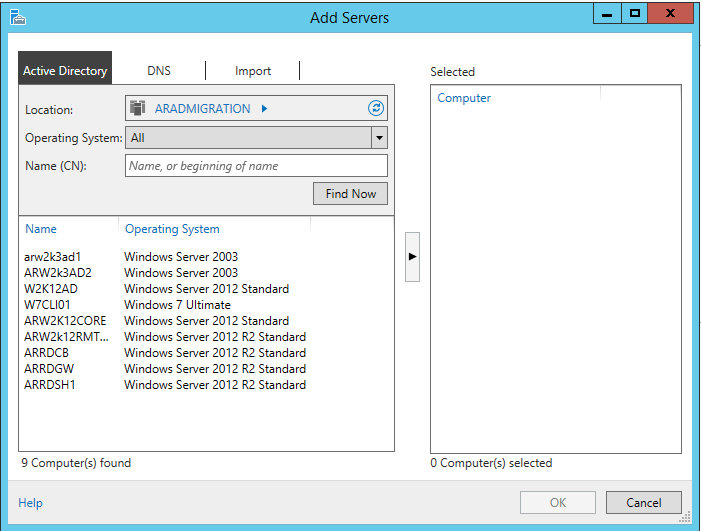 There is a cool feature in Windows Server 2012 , you can manage multiple servers using a single server. 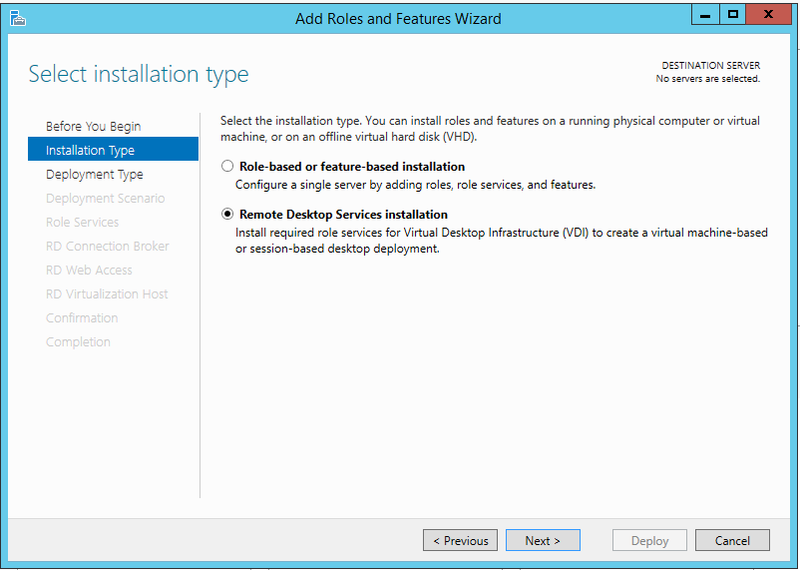 Here I’m going to manage and install these services simultaneously without login in to each and every server. 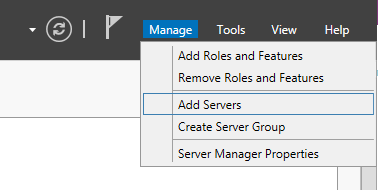 Add servers which you are going to use and click on “OK” to continue. 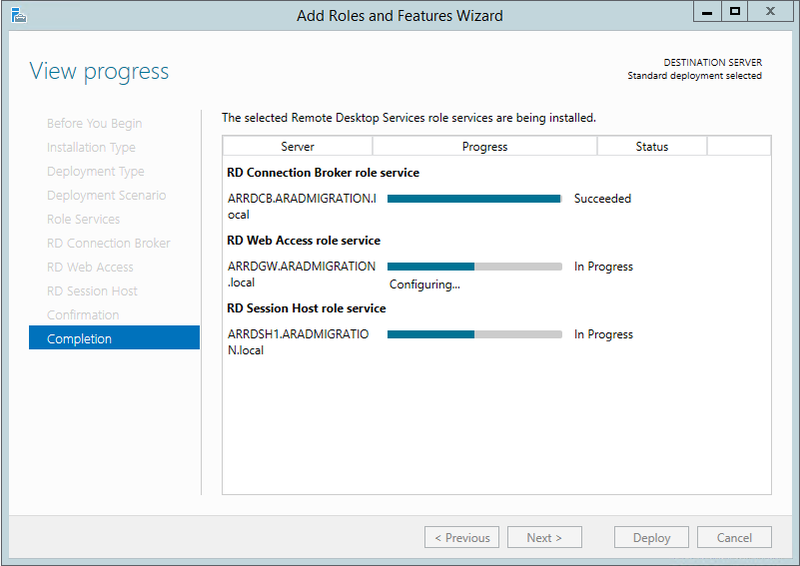 At the next window select “Remote Desktop Services Installation” and Click “Next” to continue. 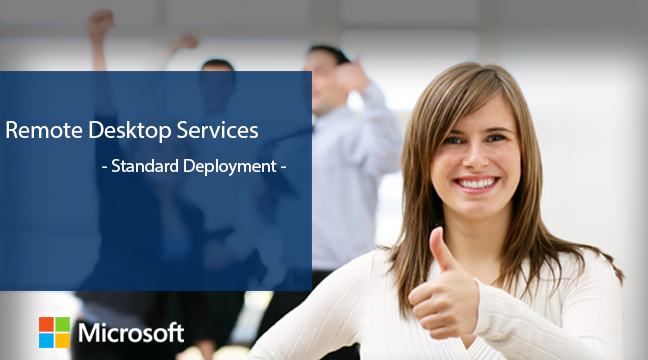 Select “Standard Deployment” at the “Select deployment type” window and click “Next” to continue. 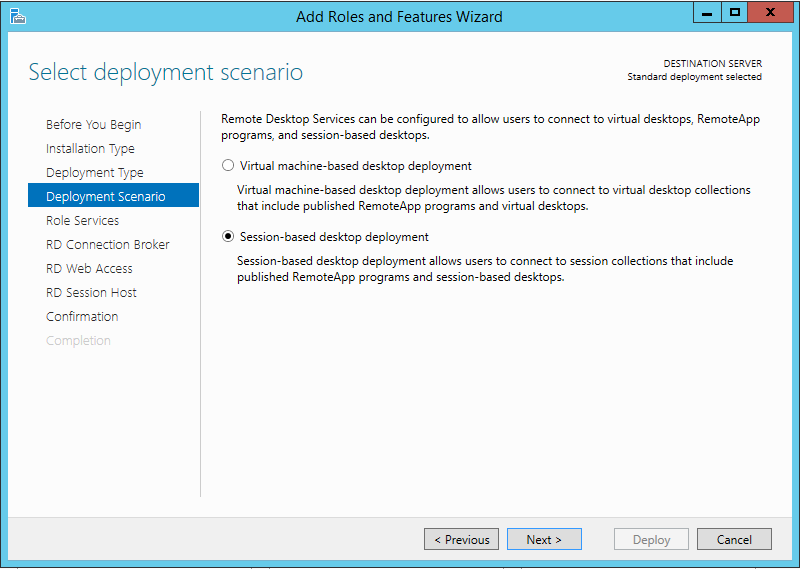 Since we are going to use session-based desktop deployment select the option and Click “Next” to continue. 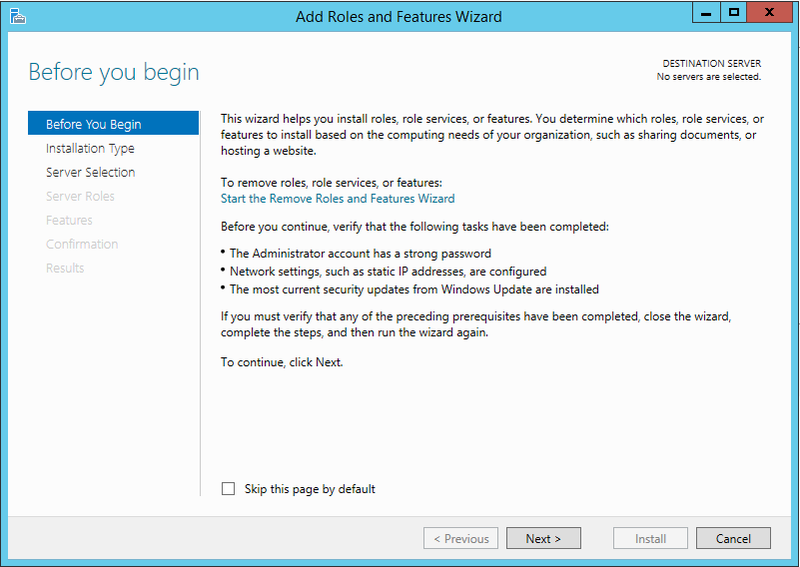 Under “Review role services” window this will give you the summery of these services and you don’t need to do anything on this step. Click “Next” to continue. 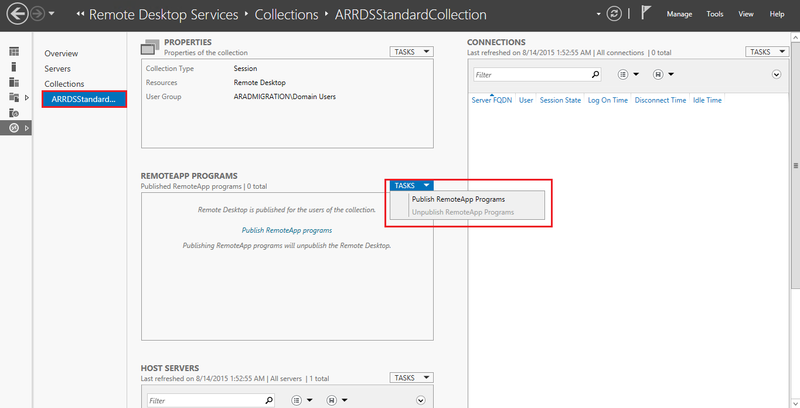 You have to do the same thing for “RD Web Access” and “RD Session Host” services, specify these servers to continue, once you done that click “Next” to continue. 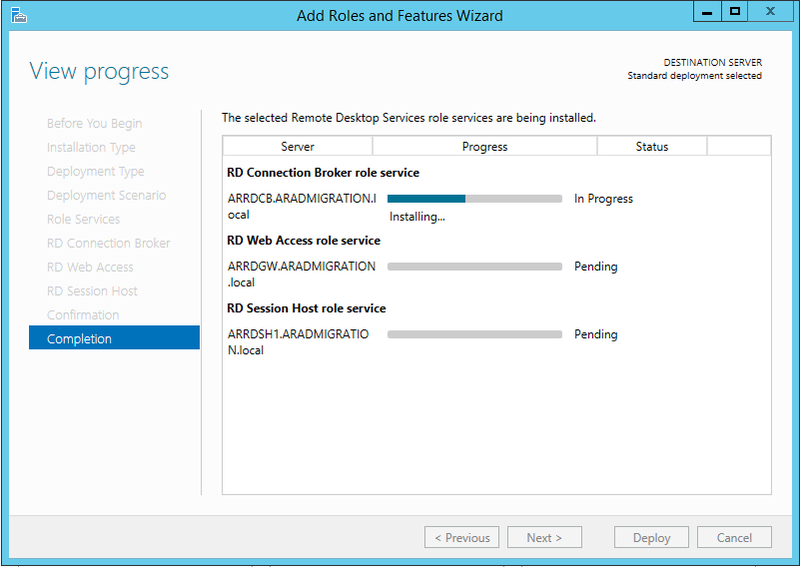 At the confirmation window select the “Restart the destination Server if required” option and select “Deploy” to proceed. Can you see any Application Published ? 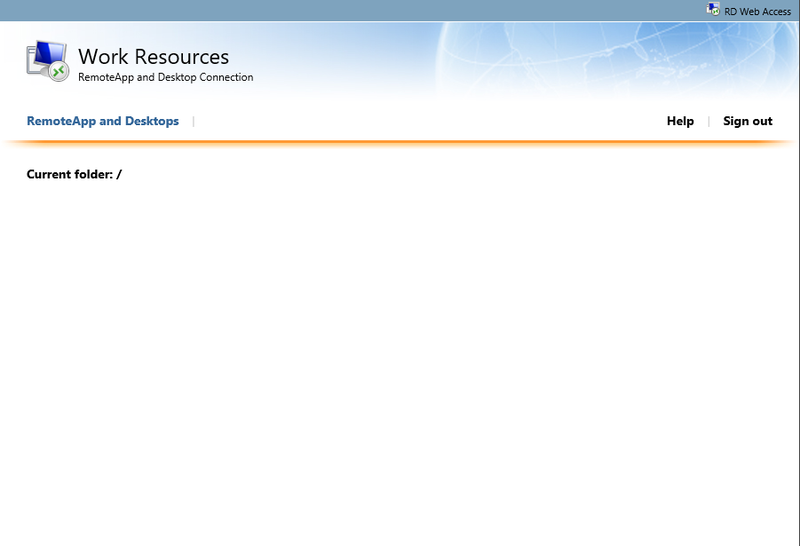 No you can’t, under Standard deployment you can’t see any application published by default. 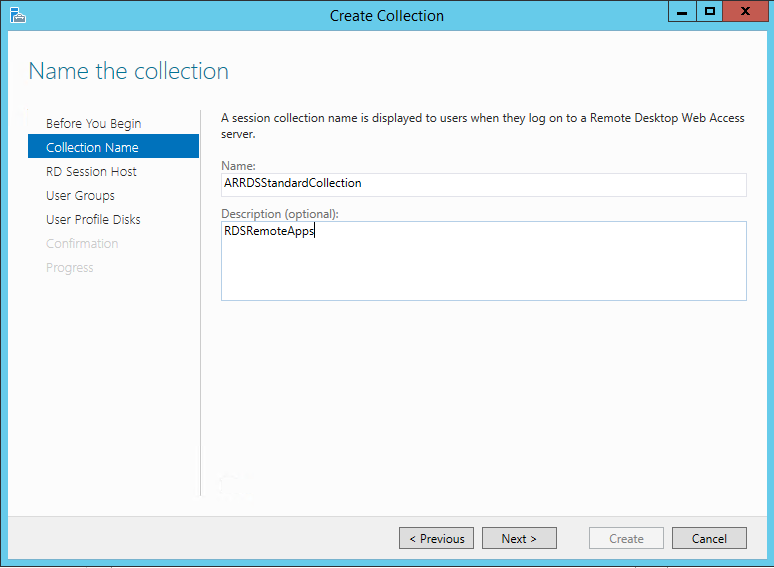 Now we are going to create a session collection to publish these remote apps. 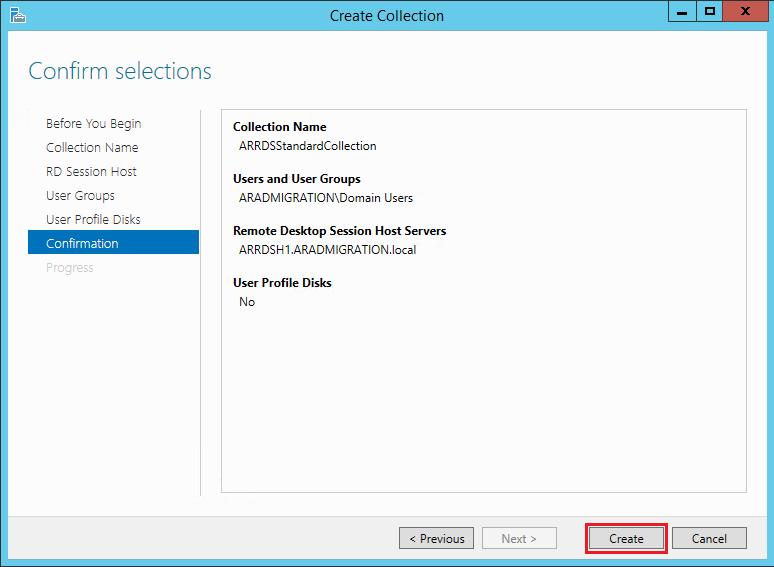 Go to “colloections” select “TASKS” on your right hand side, you’ll get a drop down list and select “Create Session Collection”. 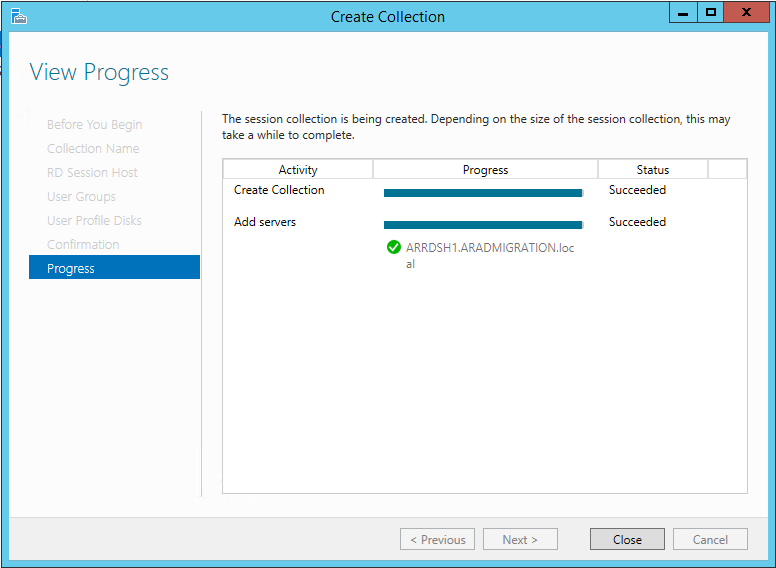 This will start the “Create Collection Wizard”. Click “Next” to continue. 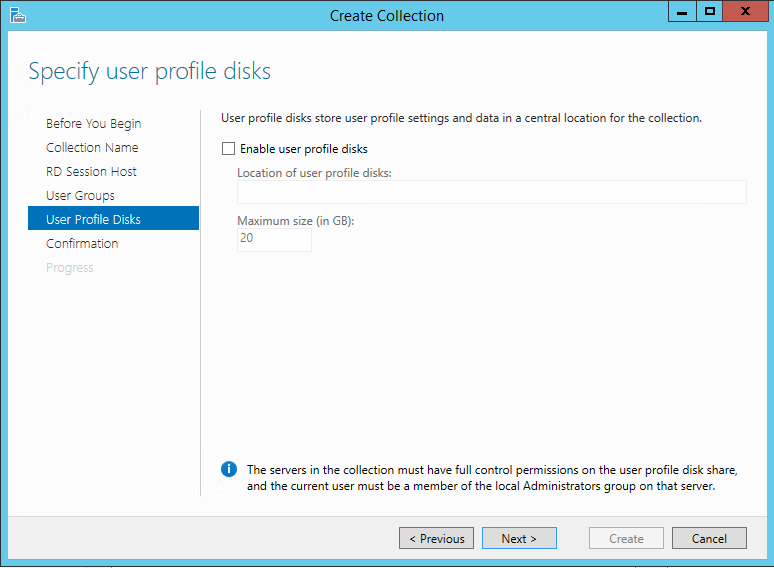 Under “Collection Name”provide a name for the collection and a description, click “Next” to continue. 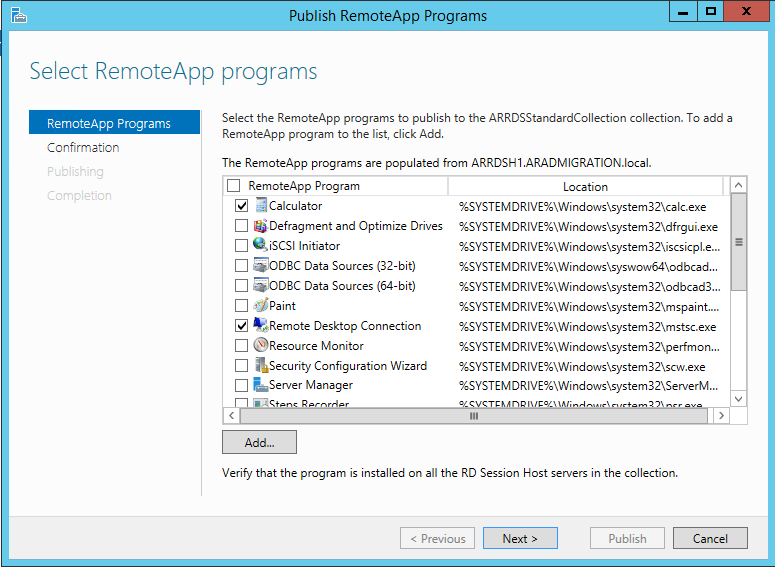 At the next step provide the RDSH server which you are going to host the Application for remote usage. 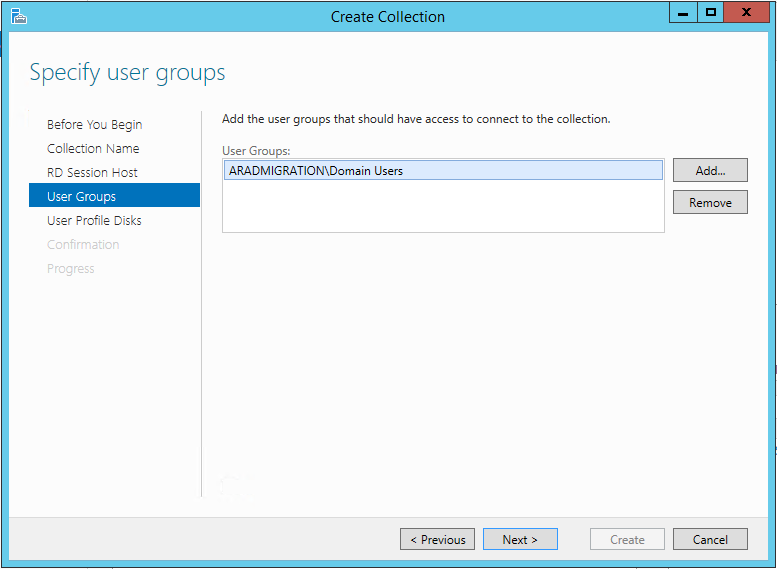 Under “User Groups” add the relevant user group that you need to grant the permissions for the users. Here I’m adding the “Domain Users” group. 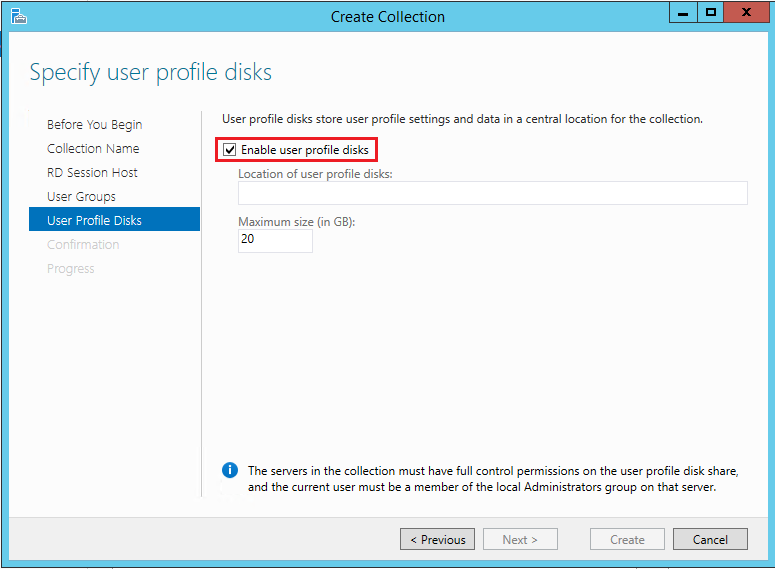 Under “User Profile Disks” I have unchecked the “Enable user profile disks” as I’m not going to store user profile VHDs in a shared location. These files will be stored on the RDSH server. Click “Next” to continue. 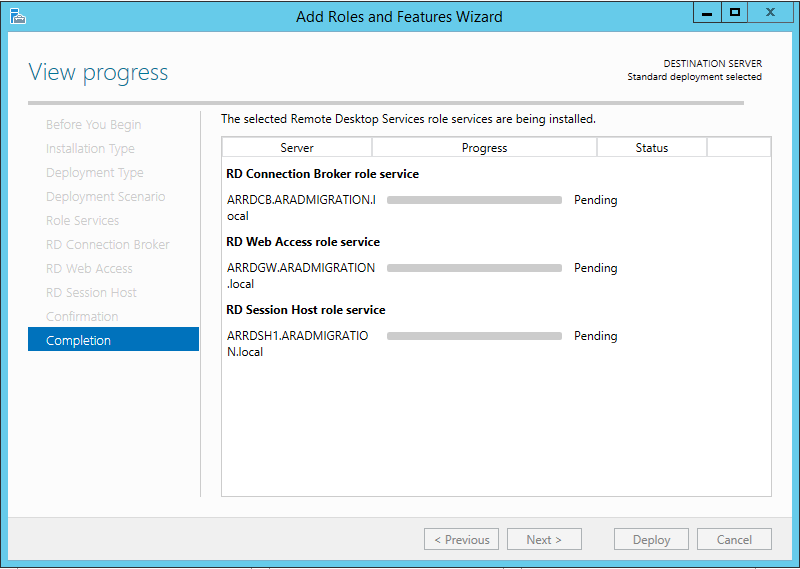 At the next step you can see the Configuration Confirmation and click on “Create” to continue. 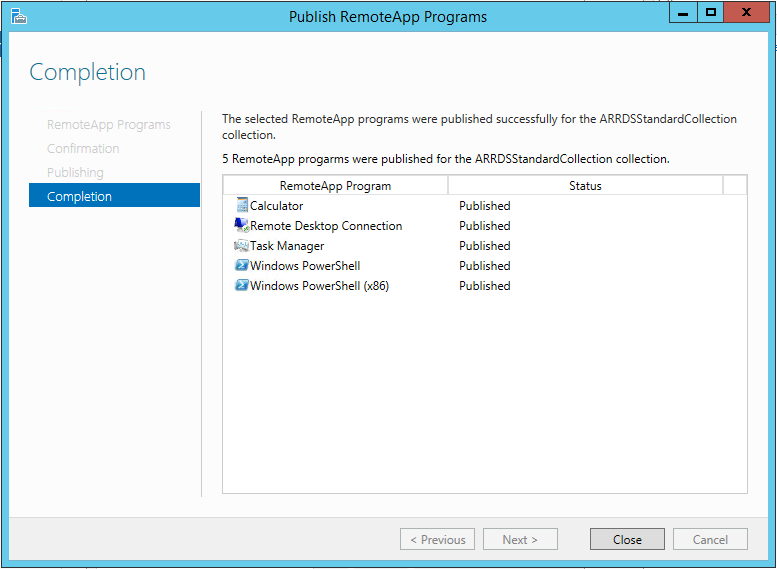 Now it’s time to publish the Applications, you can see the created collection and select the created collection, under “TASKS” select “Publish RemoteApp Programs”. 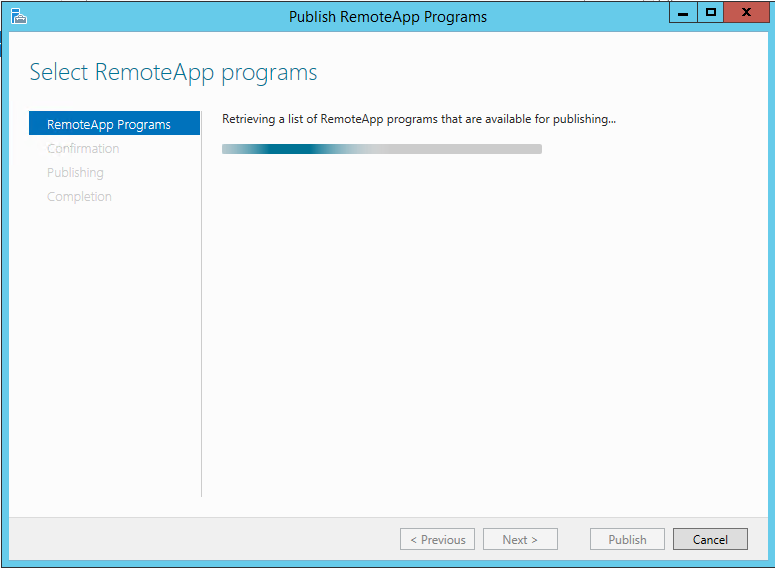 Now this will start the “Publish RemoteApp Programs” wizard. 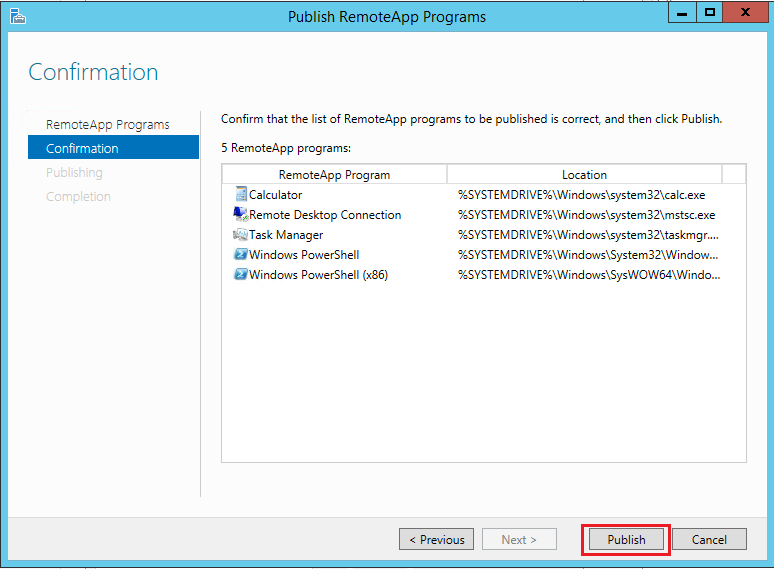 Under “Publish RemoteApp Programs” wizard select the Applications that you need to publish and click “Next” to continue. 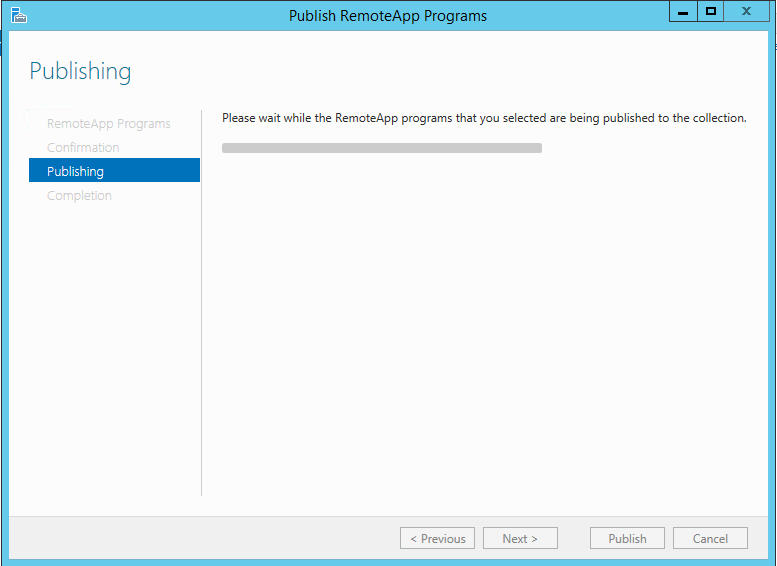 At the next window you can see the confirmation of the Applications and click “Publish” to publish the applications. 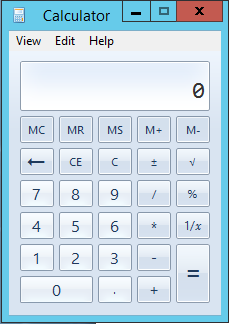 This will publish the applications and you can see the completion message. Click “Close” to close the window. We are almost done!. 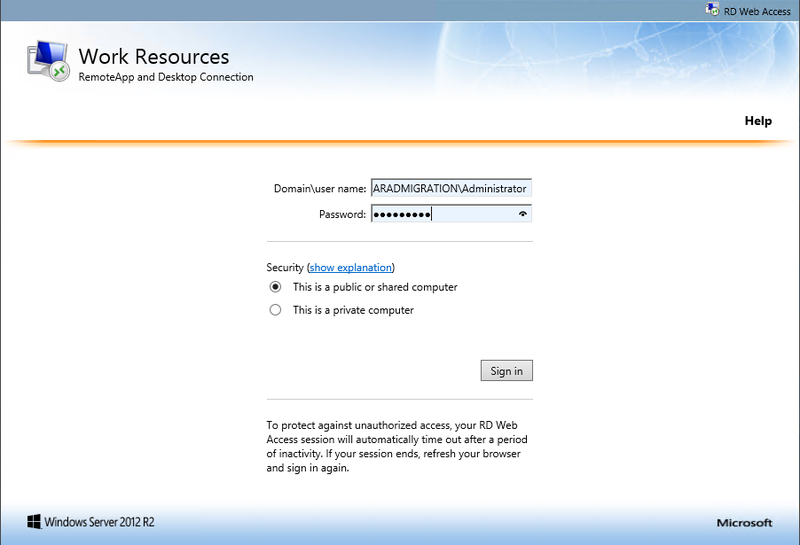 Login to the RD Web Access page and check the Applications. Can you see these Apps? Yes! now you can. Click on one of the Applications and you can see that it’s loading now, Click on “Connect” to open the application. 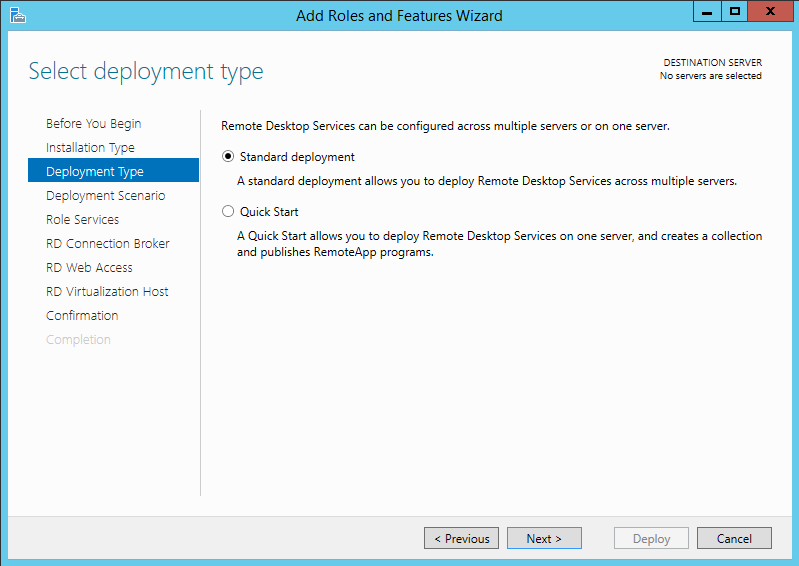 So,… We have successfully deployed RemoteApps using “Standard Deployment” method now.